A2/DAS courses from just £495 including tests! Don't put it off - book your course today! CBT's in Sussex £115 - Crawley, East Grinstead & Burgess Hill, week days and weekends. We'll take you through your CBT, A1, A2 and DAS, with an uncompromising passion for safety and quality instruction. We have a great reputation as a friendly school and we really get to know our students. Although riding makes sense economically and has less environmental impact, we never forget it also puts a smile on your face, so whether you are completely new to riding, looking for post test training, or someone returning to motorcycling, we can help you succeed without breaking the bank! Why Take Your Motorbike Training With Us? We're a family run business that takes pride in providing effective training at realistic prices with excellent pass rates for men and women, young and 'less young' riders..
We have a new fleet of Yamaha MT-07's (including a few lowered for the vertically challenged) for our DAS & A2, as well as Suzuki 500's. Our Yamaha YBR's, and custom bikes along with our Piaggio auto's are perfect for CBT's. Our free assessments ensure you only get the motorbike lessons you need, saving you time and money. We are the only school with CBT training facilities in East Grinstead, Crawley and Burgess Hill, and have the largest safe CBT enclosures in the whole of West Sussex, with fully equipped classrooms, kitchens (on site cafe at Burgess Hill) and toilets, so you have everything in one place! And between the sites we run CBT courses week days as well as weekends at no extra cost. 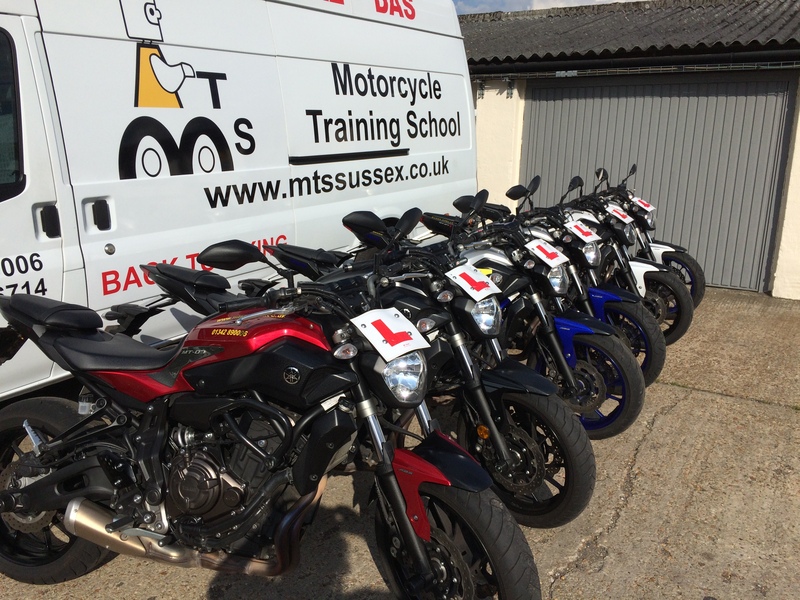 Our full motorcycle licence courses run 7 days a week from our site in Hassocks, part of Burgess Hill, we also cover all surrounding areas including Haywards Heath. Our male & female instructors are fully qualified DVSA approved, and to ensure continuity we endeavour to run each course by the same instructor throughout. We cover the all-important test route areas around Burgess Hill, Haywards Heath, East Grinstead, Cuckfield, Hassocks, Keymer & Hurstpierpoint. Our centres are in quieter locations in East Grinstead, Crawley & Burgess Hill, so you can build your confidence & experience before encountering busy roads. Don't just take our word for it - see our latest Student Passes to see how effective our instruction is, and what our successful students have to say about us. From our New Rider Course for those who want to try riding a motorbike before committing to the CBT and Full licence training, after that we offer our exclusive No 'L's Days which are great for riders that have recently passed their test and want a bit of road time or confidence building before going it alone or with buddys. While our Back to Biking Refreshers are for those with a full licence returning to motorcycle riding after a few years or any period of non biking. For your safety you must be able to communicate in English & have a basic knowledge of the highway code to complete any training with MTS. You must also wear appropriate clothing and footwear and without this you will be sent away and forfeit your training and fees. The list is non exhaustive but includes a minimum of jeans without holes, rips, tears, not shorts, skirts or track suits, and you must have sturdy footwear (ideally boots non steel toe cap), not sandals, Crocs, deck shoes or similar.